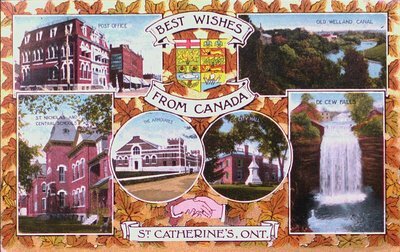 A postcard titled “Best Wishes from Canada, St. Catharines, Ont.” c1908. Contains insets of view of the Post Office, St. Nicholas & Central Schools, the Armories, City Hall, DeCew Falls and the Old Welland Canal. The Valentine & Sons’ Publishing Co., Ltd. Montreal and Toronto. Printed in Great Britain. The Valentine & Sons’ Publishing Co., Ltd.